I know what you’re thinking… I’m crazy. Hold on before you make that judgment, because I promise I can change your mind. First of all, I do not mean that sprained ankle rest is something you should’t do. You should! What I am against and what the research has shown over and over again is that prolonged rest is very BAD for a sprained ankle. And that is what most people do… they follow R.I.C.E. (Rest, Ice Compression Elevation) to the letter. In other words, they rest and rest and rest until their ankle feels better. There are some big problems with this philosophy. Anyone who has a sprained ankle knows how swollen they get. They turn into softballs in minutes and for most people, it takes months to fully heal. But, what if I told you the only reason it takes them so long to heal is because of HOW they are choosing to heal their ankles. The body is pretty unbelievable and you have to understand how it works to help the healing process along. Prolonged rest actually hinders the healing process. Why? As you can see from the headline above, lymphatic drainage requires muscle activation. That means you have to stretch and exercise your swollen, stiff ankle to help it drain all the waste in the injured area. Without the movement, your ankle cannot effectively remove the swelling. And that’s exactly what prolonged rest does to you. It keeps your swollen ankle from draining properly. So, just laying around in bed all day will not get your ankle healthy. In fact, it will ensure the healing process is sabotaged. Instead, the idea is to start doing gentle exercises and stretches as soon as possible to help drain the injured area. Now, I am definitely NOT saying to overdo it. Their is a fine balance. You want to gently move and work the ankle, but you never want to cause any pain. Feeling a little soreness is okay, but if you feel ANY pain from ANY exercise or stretch, then you should immediately back off and move onto a better stretch or exercise for you. As time goes on and your ankle gets stronger, you can challenge yourself to more exercises. After an ankle sprain, your ankle will be very weak, stiff and unstable. Guess what? Rest is never going to correct that. Rest is great after working your ankle. It enables you to regenerate muscle tissue. But, rest and rest alone is NOT good for rehabilitating an ankle sprain. Remember, the idea is to gently help your body along the healing process. Doing safe, powerful ankle exercises and stretches ensures your ankle will fully heal. Yes, you should definitely rest BEFORE and AFTER ankle rehab, but you should NOT rest WITHOUT exercise. So, as you follow a good sprained ankle treatment, your ankle will start to respond quickly and you will feel more stability and strength in the joint. As time goes on, that will continue to improve and you will find your ankle not only stronger, but more protected against future ankle sprains. So, I hope you can see that I am not against rest. 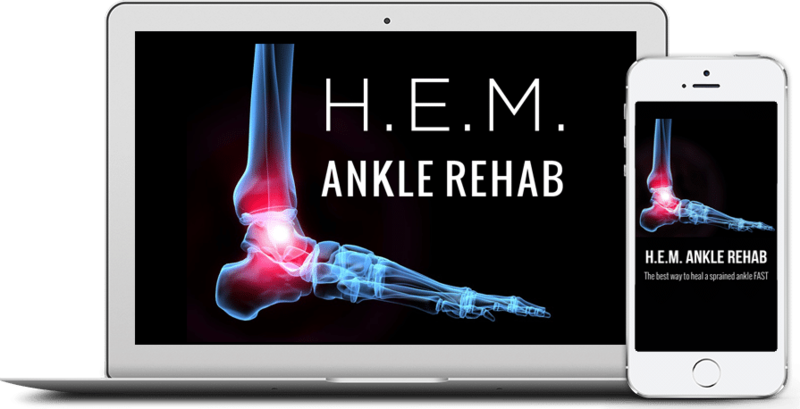 I am simply against rest to the exclusion of active ankle rehab, which your body absolutely needs to heal and get back to full strength. I hope that if you have a sprained ankle, you will take my advice and get that ankle moving as soon as possible. You will start seeing and feeling the benefits immediately. *I've had a lot of sprained ankles in my life... H.E.M. works a lot better than ice. This a really cool program and one that I would definitely recommend. *I just wanted to thank you. I had 3 serious sprains in two years and it was getting hard to skate. I started to panic a little bit... After a 2 day search, I found H.E.M. and started applying the principles. I have to say, the results are fantastic. After a while, I was able to start doing tricks I haven't done in years! *Thank you so much! It’s pretty amazing that I am doing as much as I am after a severe sprained ankle! Thanks for your support!! !